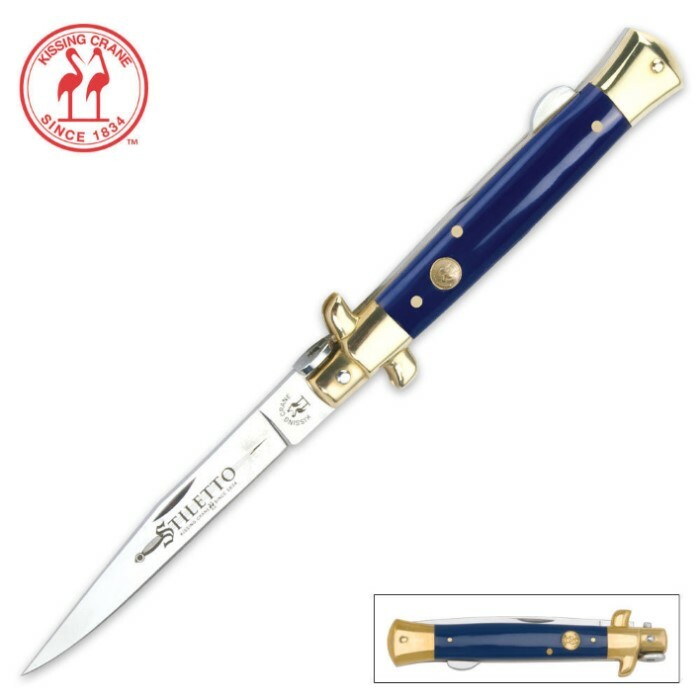 Excellent quality Stiletto knife featuring a classy blue composite handle and brass pins, bolsters and a brass shield on the handle. The 4 in. mirror polished stainless steel blade includes an attractive Stiletto logo etching. Combines elegant style with great protection.4 3/4" closed. 8 3/4" overall. Please note this is not an automatic operation switchblade knife. First, I understand the China label is a total turn-off for some, however, the quality IS there for the cost (around $13) of this knife. Second, the knife I received had fit & finish issues consistent with any Chinese production knife. There are a few "scuffs" on the the plastic handle scales. Minor & superficial issues, really. The only observation of any real concern is the amount of movement the blade has while folded; between each handle scale. That's the only aspect to the knife that feels "cheap" to me. On a personal note, I would have preferred the traditional stiletto-style bayonet blade, rather than the drop point present. Otherwise, this inexpensive piece adds a bit of color and style to my "high-value" collection. Considering design, materials, and price...I'm very pleased. Thanks, BUDK.